1. James FERGUSON of Pitfour, son of James FERGUSON (1672-1734) and Anne STUART of Crichie (1669-1731), was born in 1700. He had the title '2nd of Pitfour'. He married Anne MURRAY on 3 February 1733 in Aberlady. 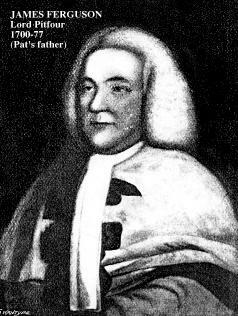 He died on 25 June 1777 in Woolmet. Lord Pitfour was an eminent councillor at law (a Lord of Session and Justiciary) highly distinguished for his probity, integrity, and knowledge of his profession. He was also Commissioner of Justiciary. He was created Lord Pitfour in 1764. 2. James FERGUSON, son of William FERGUSON of Badifurrow and Jean ELPHINSTONE of Logie, was born in 1672. He was a Sheriff-Depute of Aberdeenshire. He had the title '1st of Pitfou'. He died in 1734. He married Anne STUART. Elizabeth FERGUSON (1698-1781). Elizabeth was born in 1698. She died in 1781. 4. William FERGUSON of Badifurrow married Jean ELPHINSTONE.